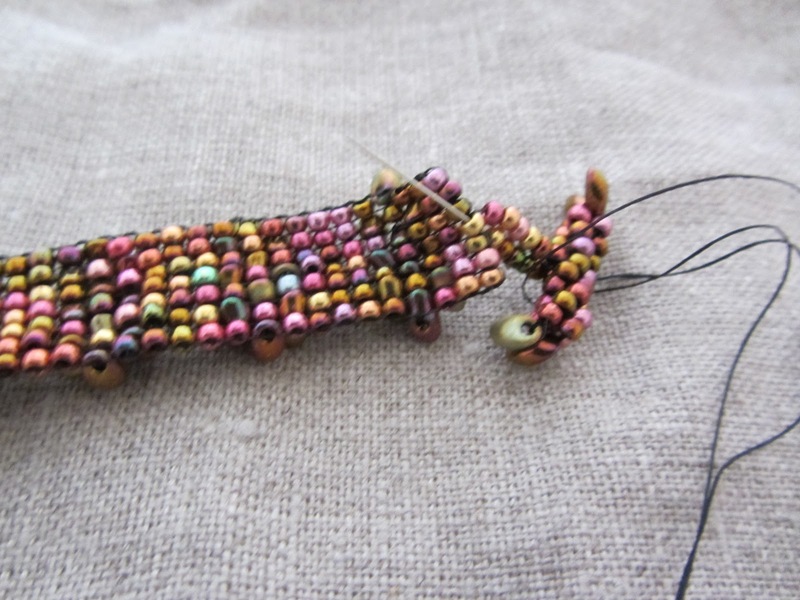 Today is the day we finish weaving our bracelet, take it off the loom and create a loop and a clasp. 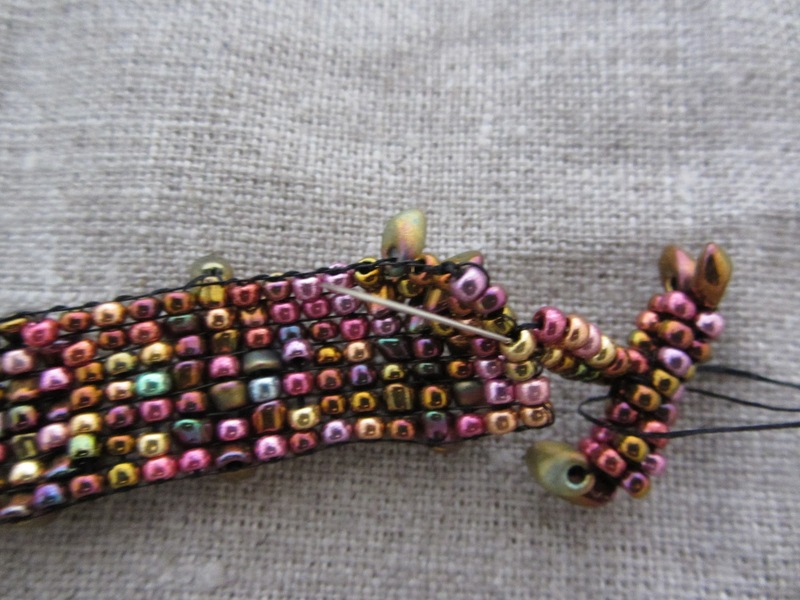 You will notice that my last section of mixed bead rows is only two rows wide instead of three. I was finding it difficult to fit in the magnatamas. 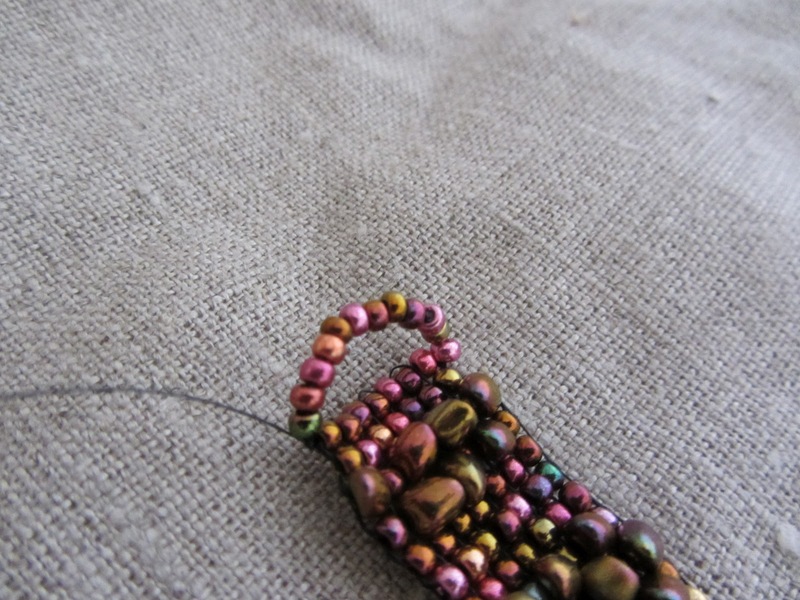 So I reverted to just size 8/0 beads because they were much easier to insert in that smallish space. 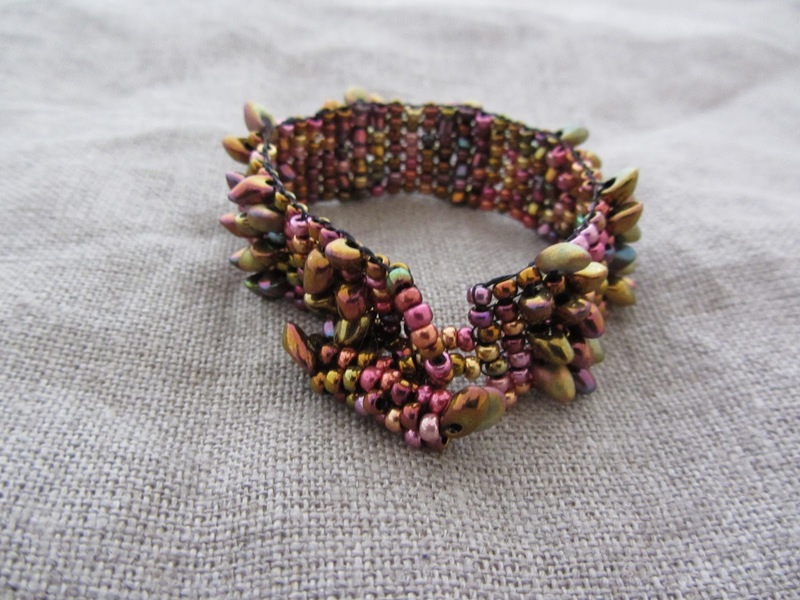 I released the tension on the loom and slipped off the bracelet. I then removed the paperclips. 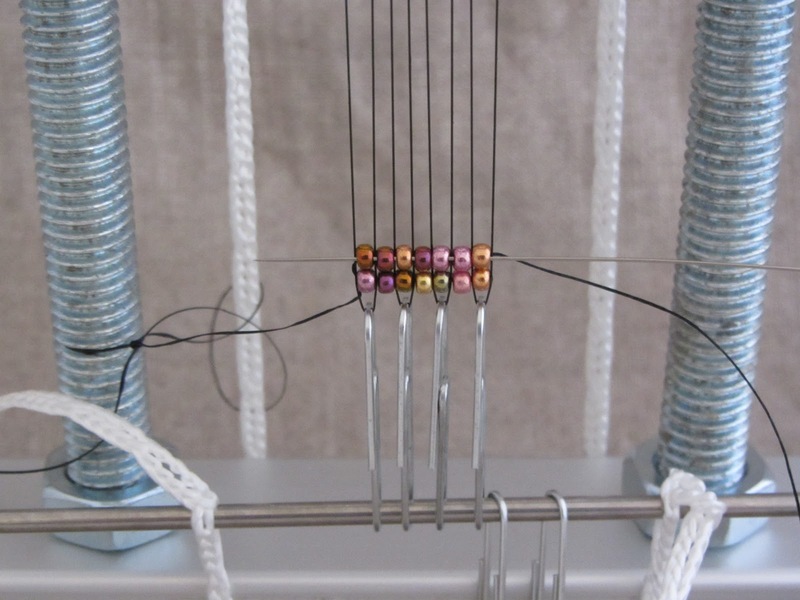 Using one of the warp tails, I strung twelve size 8/0 beads to form a circle for the clasp. 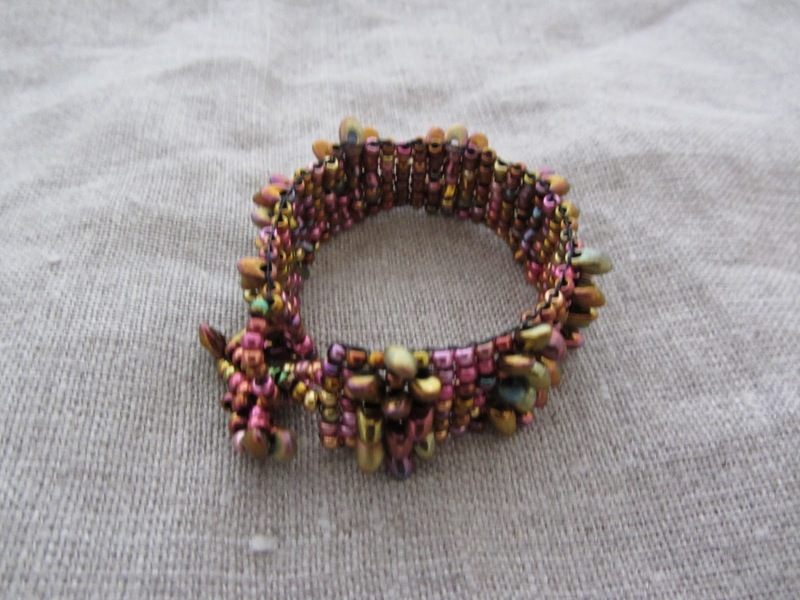 I used the other warp to sew through this circle from the other side to: 1) get rid of that warp tail, 2) to make the circle of beads as strong as possible. Bury the ends somewhere in the bracelet, tying a knot and then sewing some more before trimming. 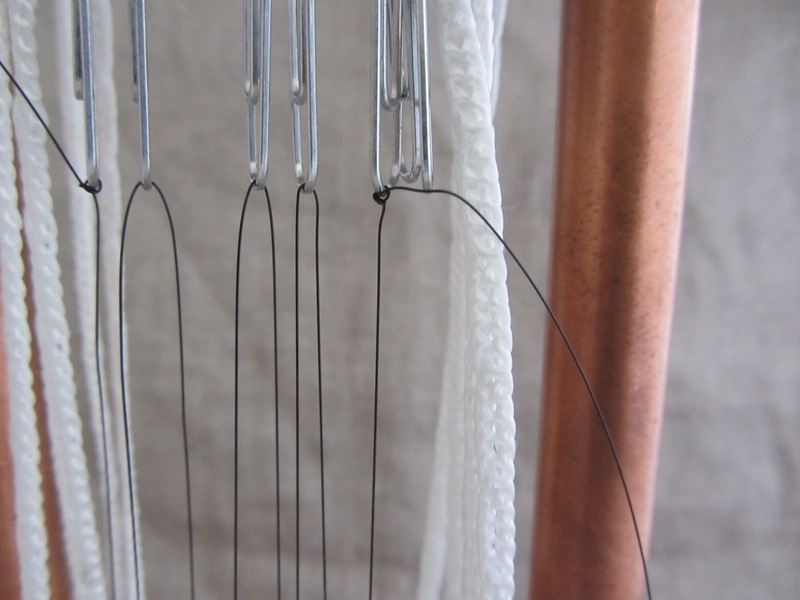 If you don’t have a softlex needle, which can be threaded by the softflex wire, just use the wire without a needle since it is stiff enough to allow you to string beads on to it. Next you need to make a peyote tube. 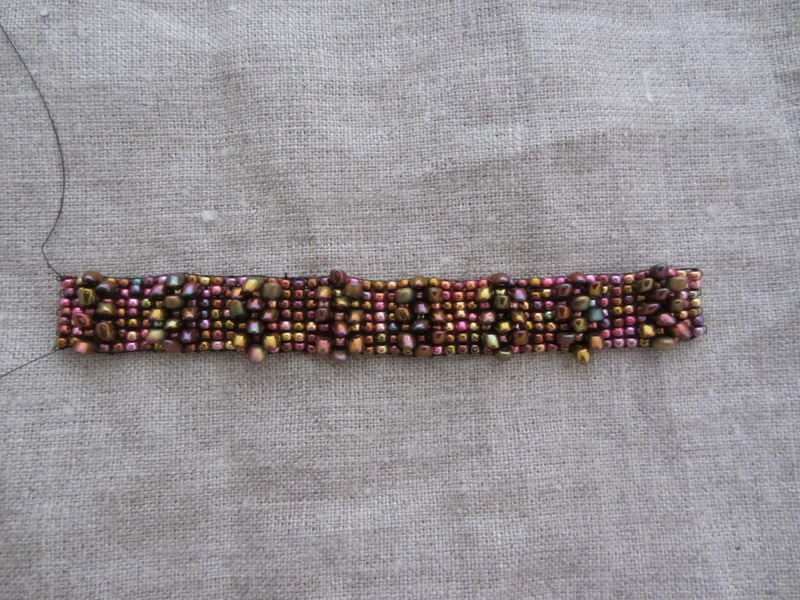 Using the size 8/0 beads make a flat piece of peyote eight beads wide (or even ten if you’d like). Zip it up as per the above linked directions. Sew in tail end. I decided it would be fun to add two magnatamas to each end. They will also help prevent the clasp from coming undone. 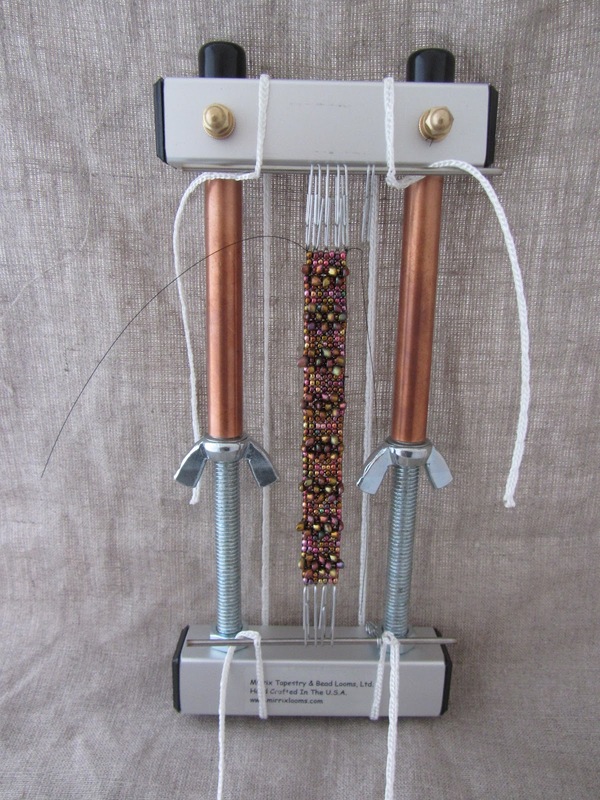 Find the middle of your peyote tube and get your thread centered there. 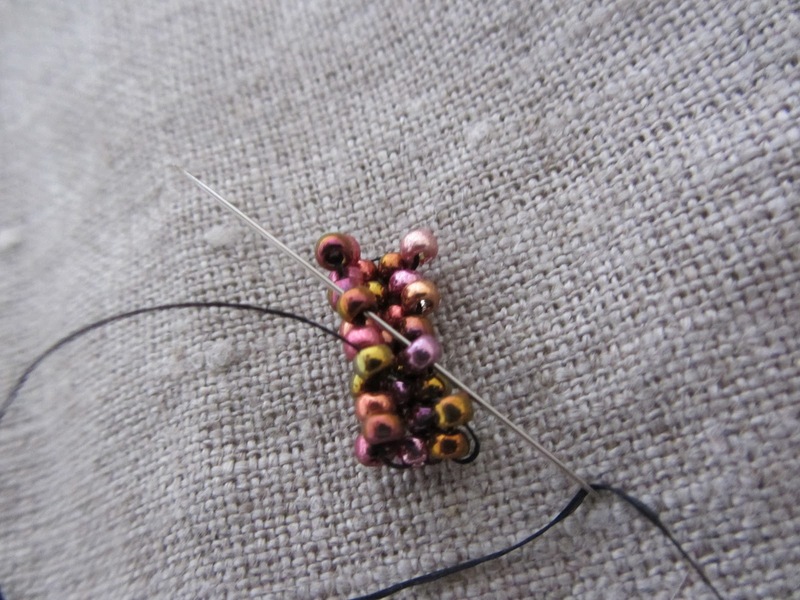 Determine how much length you need to add to your piece in order to have a comfortable, but not too loose, fit. I determined that I needed five beads. 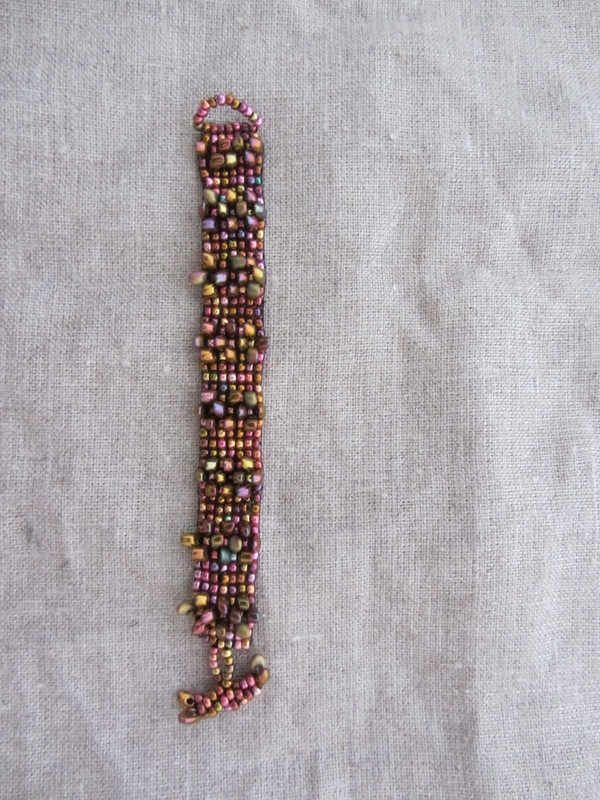 So I strung five beads and then sewed through the middle bead on the end of the bracelet. I strung five more beads and came back through the peyote tube. 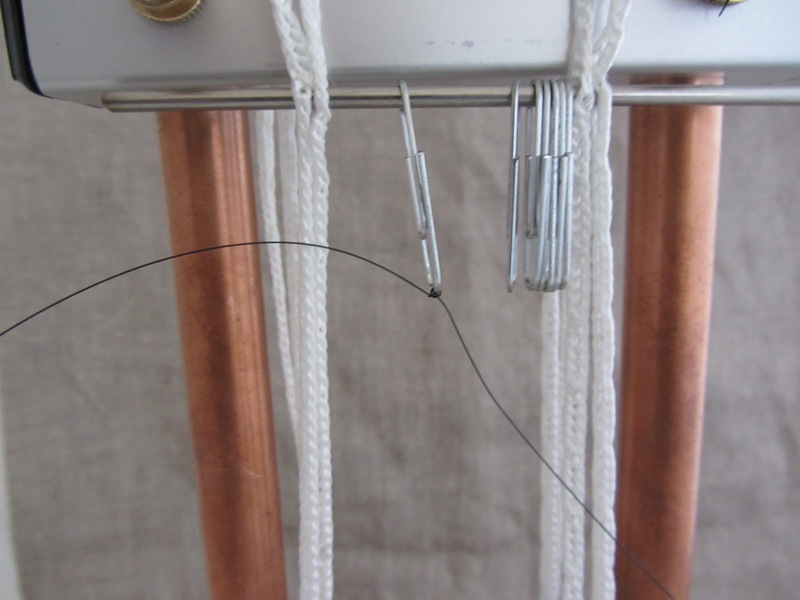 I sewed back and forth through the attachment several times in order to make it strong. Remember, there is going to be quite a bit of tension on this so you might as well over engineer it. I really like the look of the magnatamas on the end. Gives it a very finished look. There she is . . . all finished and ready to wear. More pictures of what your piece should look like. 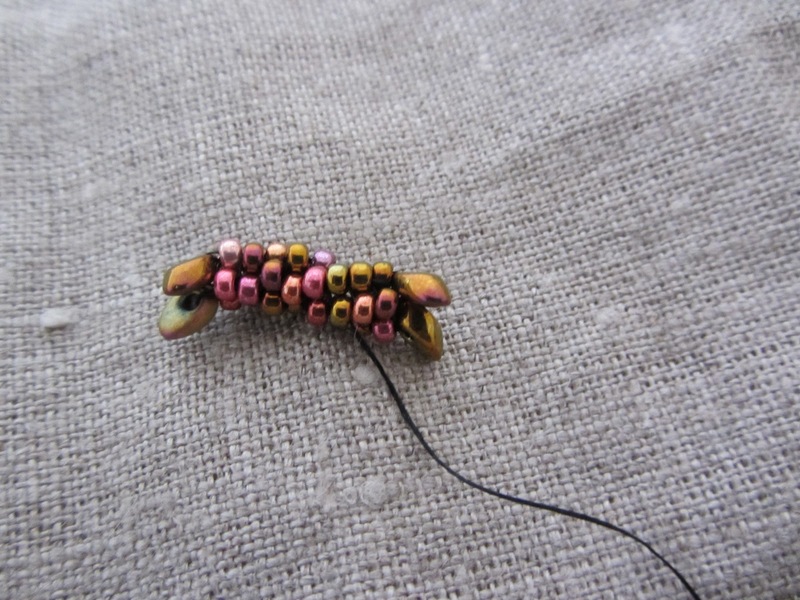 And this final one is an example of using a glass button instead of a peyote stitched tube. 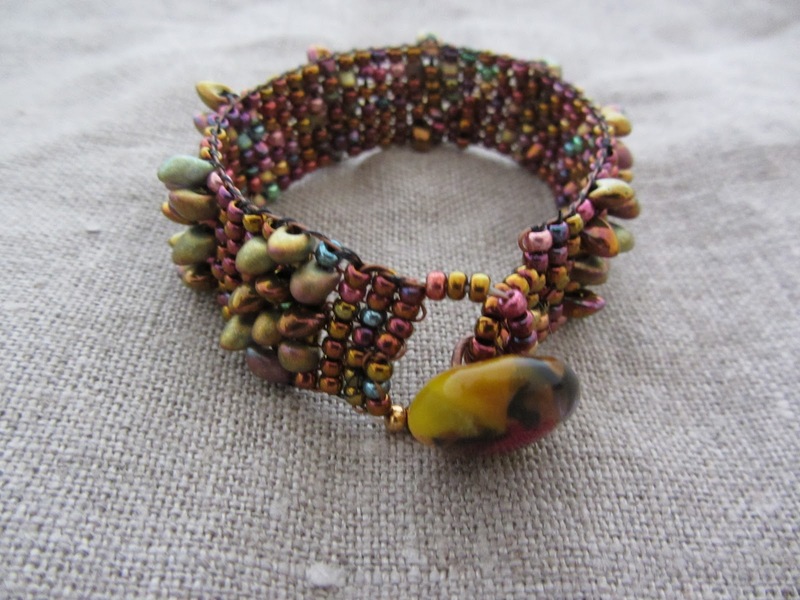 You can use anything you want as long as it keeps the bracelet closed and, of couse, also looks beautiful. We hope you enjoyed this adventure and are ready to make a second one! 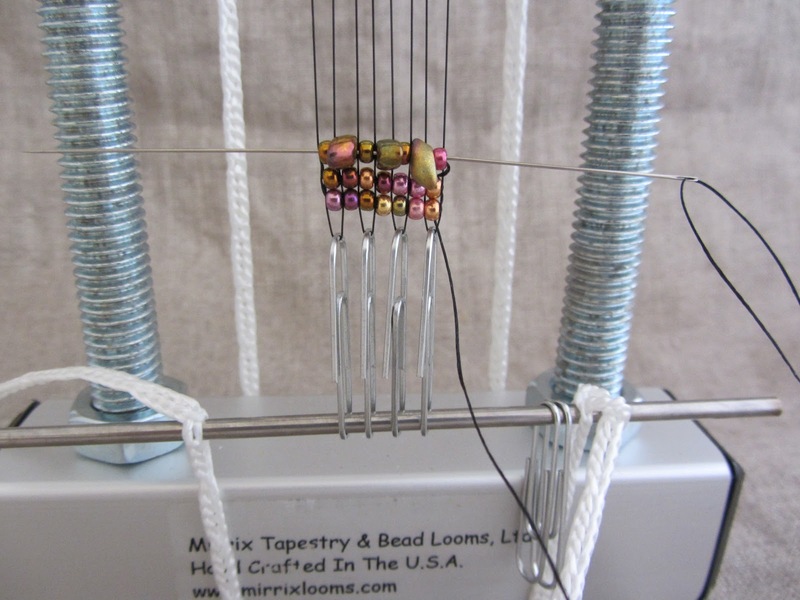 For this project, you will need a Mirrix Loom with a No Warp-Ends Kit. We have these available for our new sized 5″ Mini Mirrix and also for our 8″ Lani Loom, 12″ Little Guy Loom and 16″ Big Sister Loom. The kits can be purchased here. 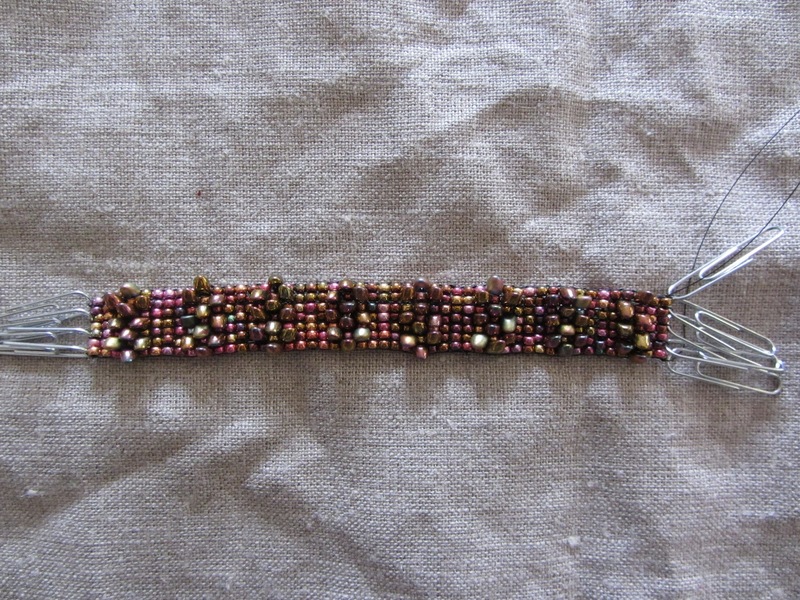 The project is done with our No Warps To Weave in Bracelet Kit. 1) Slide the required number of paper clips on each bar. 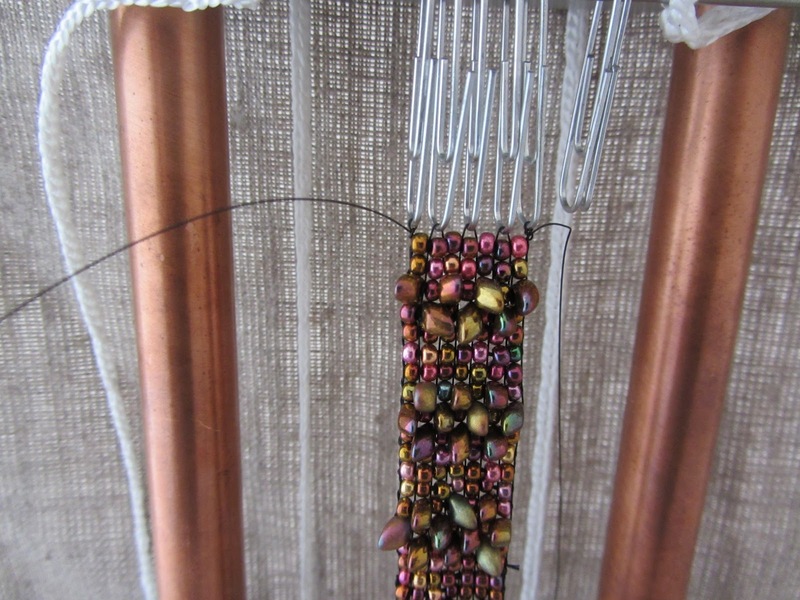 If you don’t put enough on, don’t worry because you can always add more while the bars are on the loom. If you put on too many, you can slide the clips to the side. 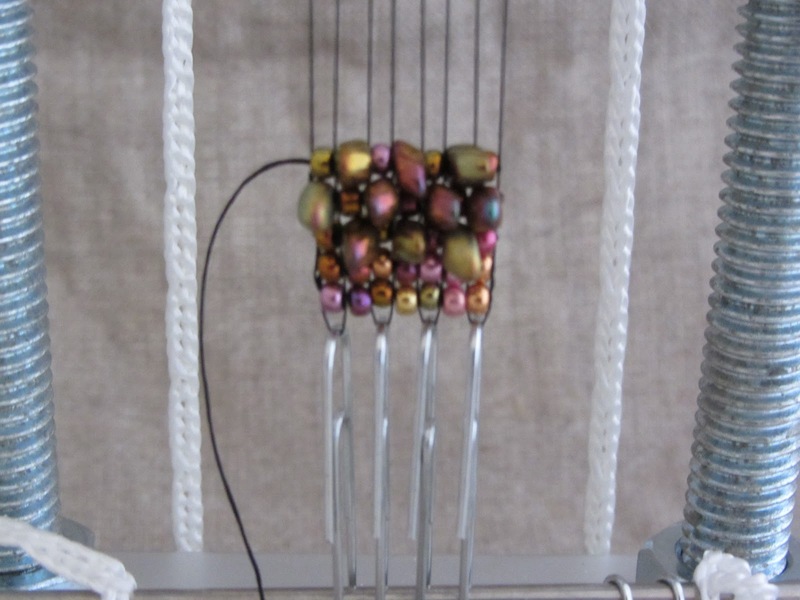 In this example, we used five clips on the top and five on the bottom for a piece that will be nine beads wide. 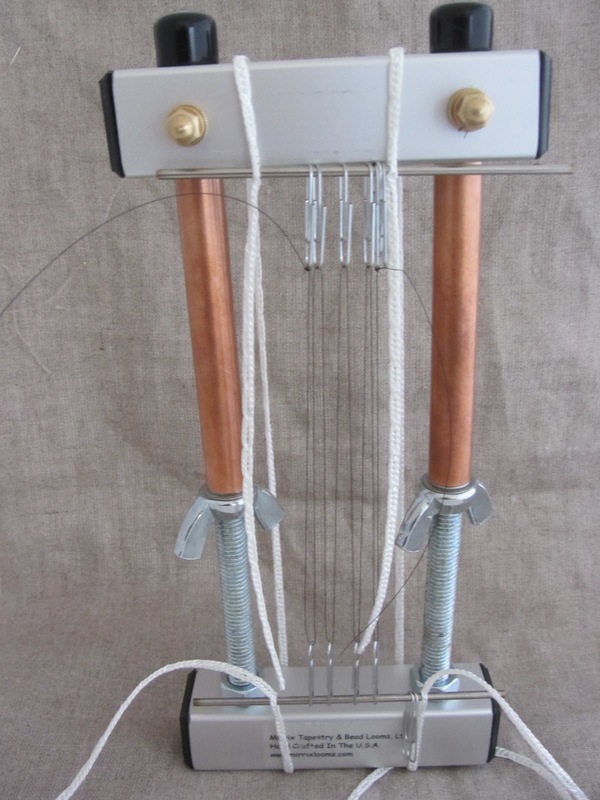 For this piece we will be using eight warps, so put four on the top bar and four on the bottom. 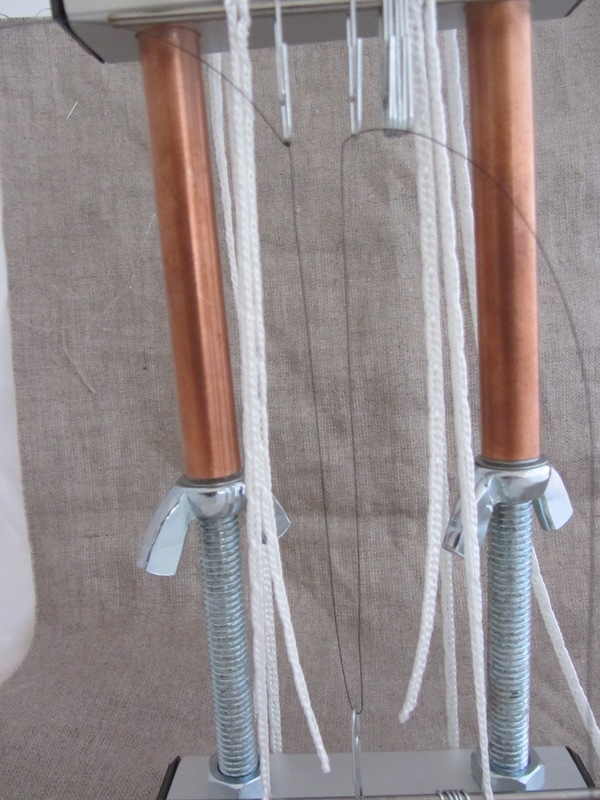 2) Loop the two pieces of cord over the top of the loom. Stick the ends of the top bar through the loops near the end of the cords. 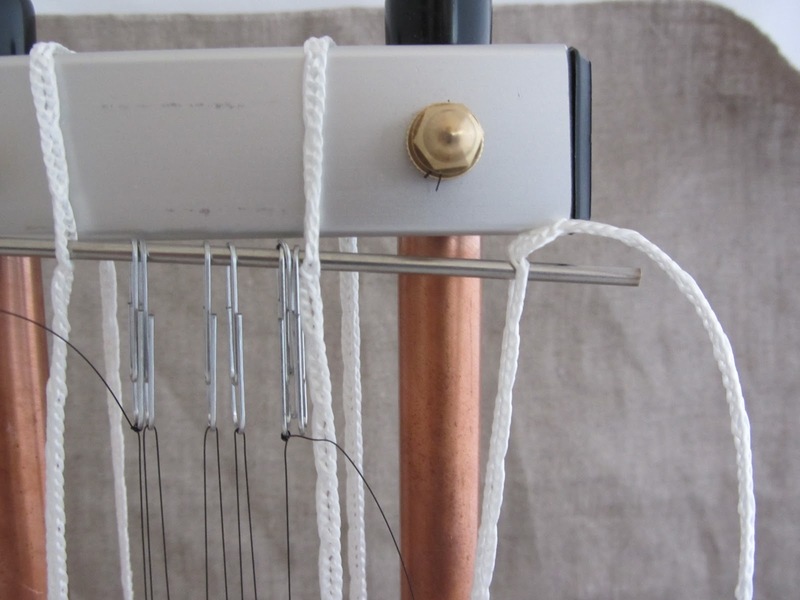 Take the other two tales of the cord underneath the loom and up to the top bar. You will be attaching the cord to that same top bar (the bottom bar gets inserted later). Make sure each cord is the same length. It does not have to be tight. The tension will be adjusted later. 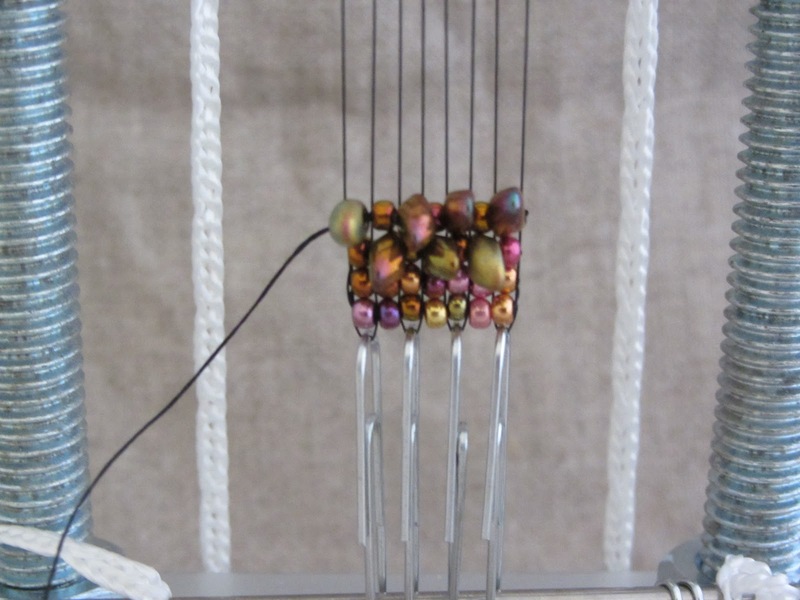 3) To attach the bottom bar, first measure down from the bottom of the paper clips of the top bar to the place on the cord that is the length of the piece you want to weave PLUS the length of the paperclips on the bottom bar. 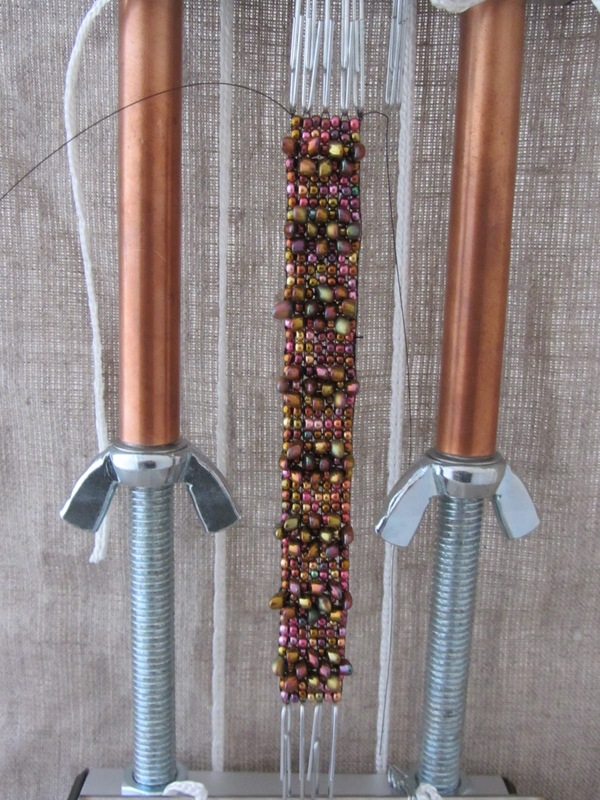 I am making my bracelet six inches long. Stick the bottom bar into the two cords at this place. It will easily slide into the holes of the cord. 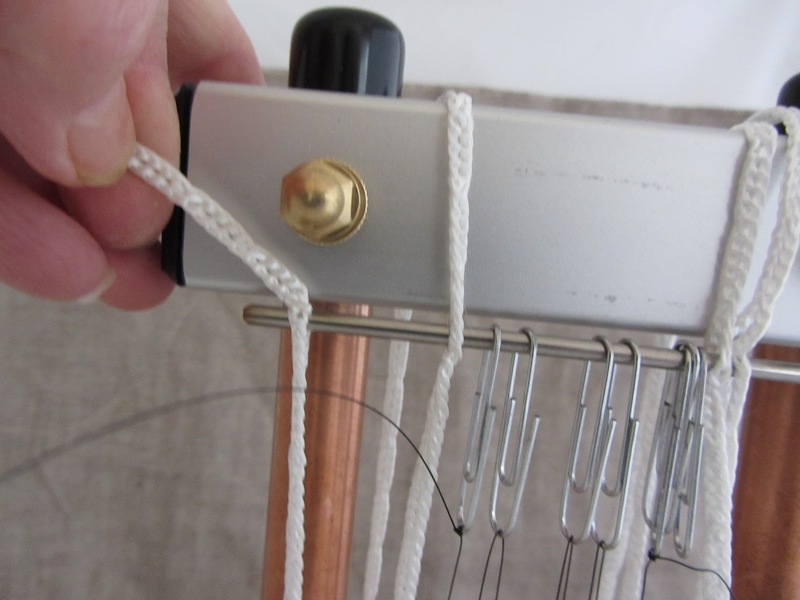 4) In order to warp the loom, tie (or use a slip knot to attach) your SoftFlex wire to either a top or bottom paper clip and then in a zigzag pattern slip your warp through the top and bottom paper clips until you have as many warps as you need. Tie off (or use a slip knot) on the final paper clip. 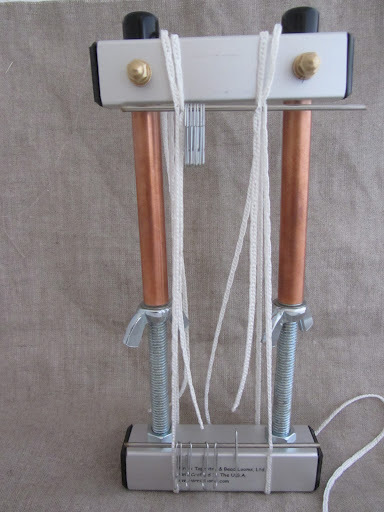 5) Slide the cord that is on the outside of the top bar (the cord that runs the same path as your warp) off the top bar. Now you just have warp between the bars on the front of the loom. 6) Evenly space the paperclips. 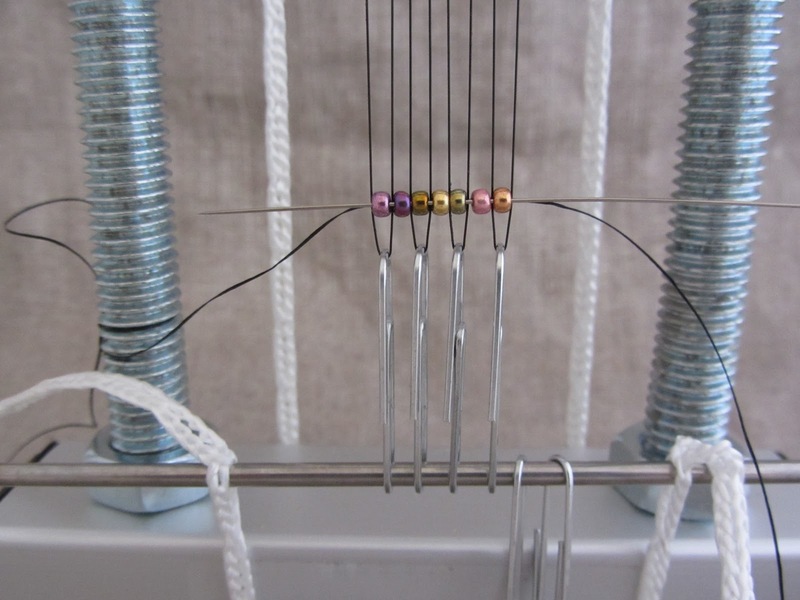 Apply tension on the loom. Now for the fun part. Tie the end of a three foot piece of C-Lon thread to side bar of loom. 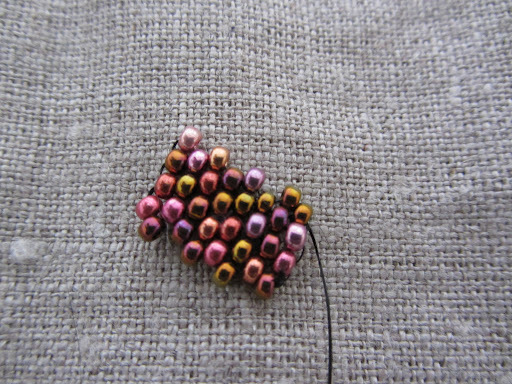 Weave two or three rows of just size 8/0 beads. Follow those rows with a row of alternating 8/0s and magatamas starting with an 8/0 on the outside. 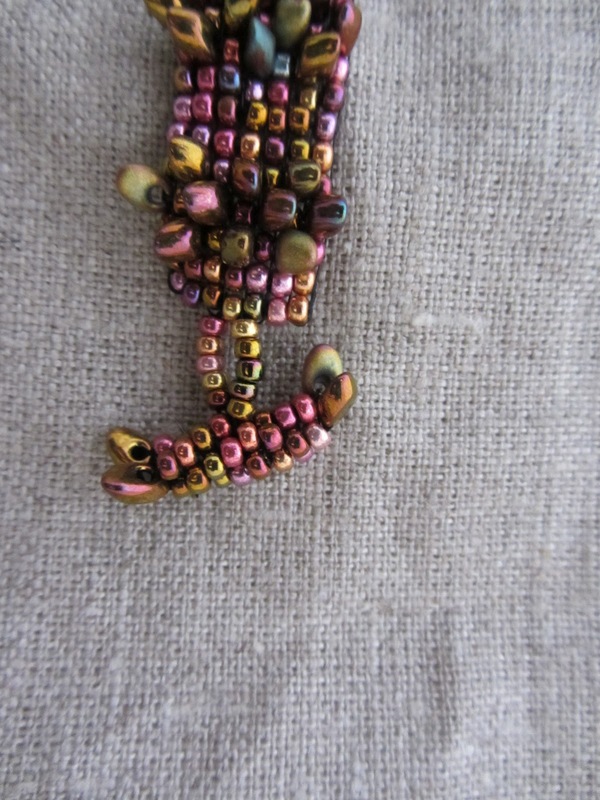 The next row will also alternate these two beads but with the magatamas on the outside. 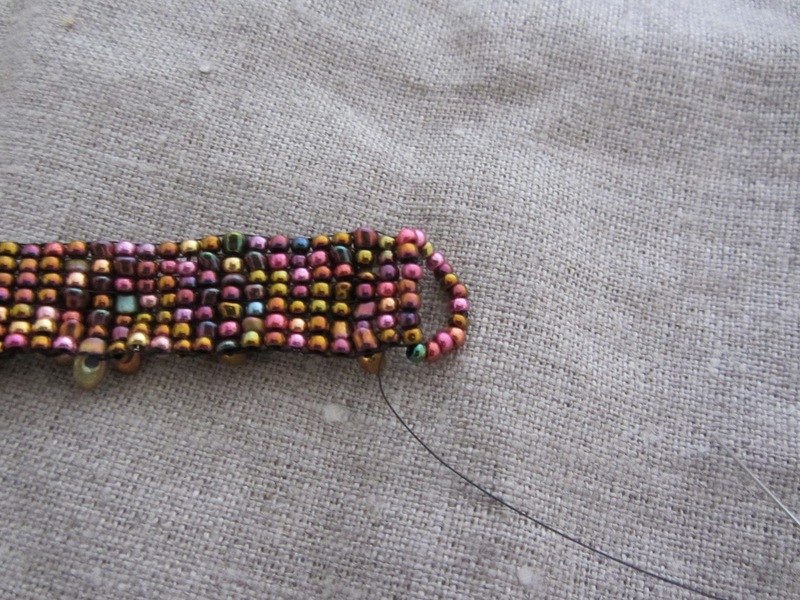 Follow this with a row starting with a size 8/0 bead. 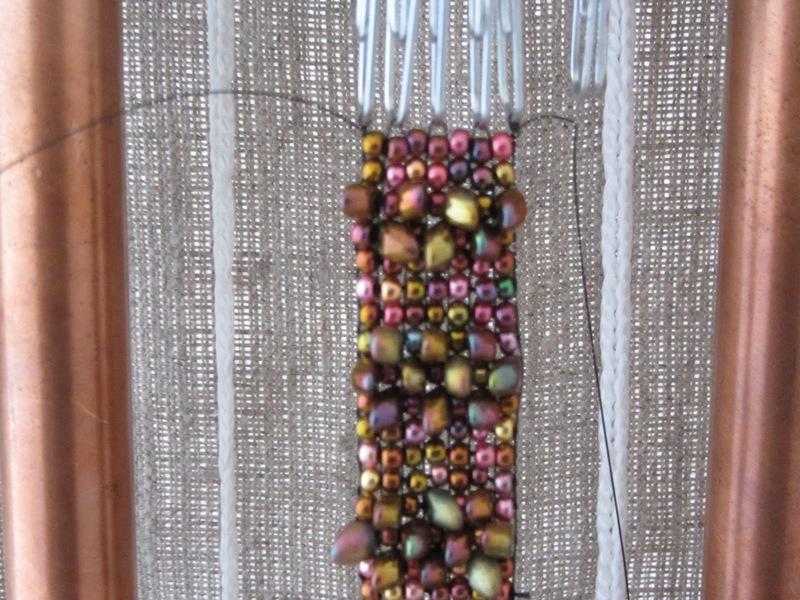 Continue this pattern of three rows of just 8/0 beads and three rows of mixed beads until you see that you have room for only three or four rows of 8/0s. Weave until you cannot fit in another row. We will finish our bracelets next week!